Mike and I love when doing our jobs lead us to new relationships and happy clients. We had the opportunity to market a beautiful 15-acre piece of land with a sophisticated farmhouse and resort style pool/pool house. This beautiful home is located in Franklin, Tennessee just minutes from Leiper’s Fork. We knew we could help this family sell their $1.6 million-dollar home in a timeframe they were hoping for. We also knew we could save this family thousands at the closing table. The sellers trusted the Gray Fox Realty marketing systems and allowed us to get to work marketing their home. 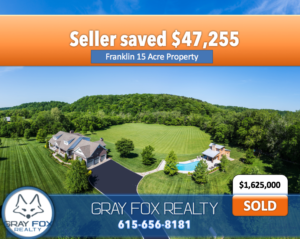 As a result of the Gray Fox Realty Full-Service, Flat-Fee system this family saved $47,255 in commission dollars that otherwise would have been paid to a real estate brokerage. 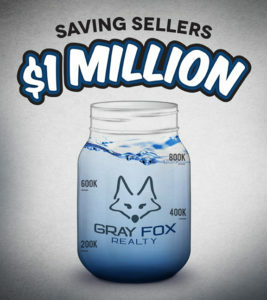 Now that’s what Gray Fox Realty calls: helping someone “keep the equity”. If you are interested in learning how you can save thousands selling your home click here and Mike or I will get in touch with you to set up your in-home consult. We can help you sell and find your next home. Start your search now.